Home EEE Topics Why is an ammeter connected in series in a circuit? Q. 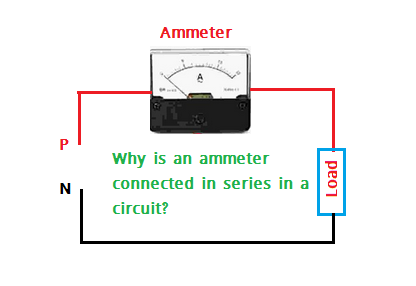 Why is an ammeter connected in series in a circuit? An ammeter is a low resistance device. When it is connected in series in a circuit, the total resistance of the circuit does not increase appreciably and hence the current in the circuit remains unaffected. And the ammeter is a low impedance device, connecting it in parallel with the circuit would cause a short circuit, damaging the ammeter and/or the circuit. প্রশ্নঃ এমিটার কেন সিরিজে সংযোগ করা হয়?